Dress Socks or No Socks? When is it appropriate to sport the “no sock” look? You know the one I’m talking about, the guys wearing loafers, suits, and pants that are a little higher up so you can see their ankles….and the fact that they’re not wearing socks. You commonly see this around fashion shows, but when else is it appropriate to be forgoing socks when wearing a suit? Over at Made Man, Joshua Fruhlinger remarks his disdain for men “rolling up their trousers, slipping on leather dress shoes, and leaving their socks at home.” He equates the look to when people decided that wearing a blazer with jeans was ok. I totally get it. It’s someone wearing a very formal outfit but still attempting to appear casual and fun. Suits were made to be formal. They’re meant for business meetings, weddings, and other important events. Another argument against the “no socks” look is the fact that it can bread bacteria. When your feet sweat into your shoes it turns them into a sauna. This is a breeding ground for bacteria that thrive in moisture. It can make your shoes start to smell as well. Over at He Spoke Style, Brian mentions that there are 3 divisive things in the entire world: politics, sports, and the age-old socks or no socks debate. He says the issues is “so incredibly polarizing”. He argues for and against the no socks debate. His “no socks” pro argument is that it makes you stay cool on warm days. Another point is that for some shoes, like boat shoes, you aren’t supposed to wear socks with them. Over at The Shoe Snob Blog, the author Justin argues that it’s really based on the outfit. He says an outfit like tan shoes, loafers, khaki jeans, a casual button up, and a sportcoat can allow for the no socks look. Will this question ever have a clear answer? No, I don’t see one. From what I’ve heard and read, there are people who embrace the no-socks look, and those that despise it. There are also many people in the middle who don’t care much either way. If you do plan to try out a no socks look, get a second opinion from a trusted friend who will give you honest feedback. Also, try not to forgo socks if you plan to be wearing the outfit for more than a few hours. The last thing you need is to come home with shoes that stink. 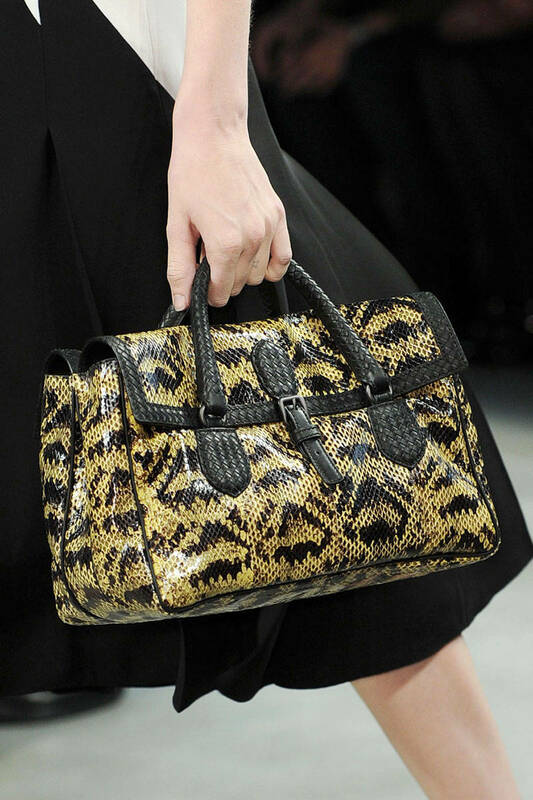 When it comes to fashion, accessories play a major role. 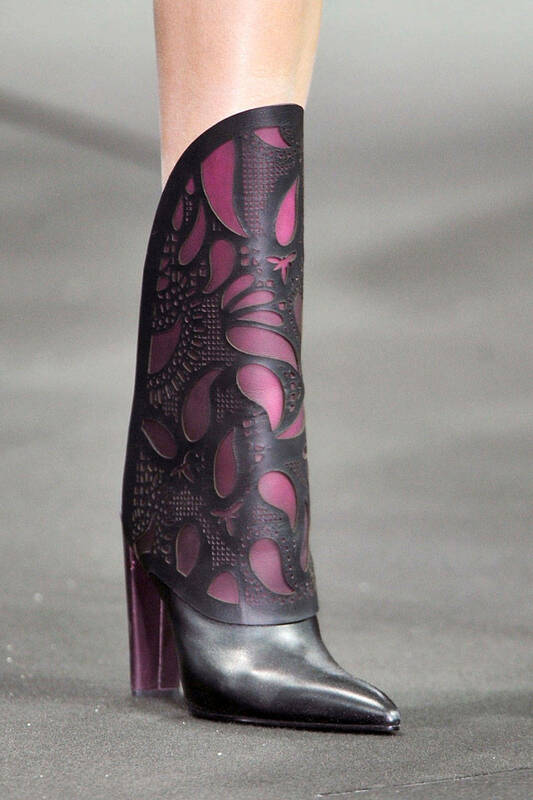 This blog take a look at what’s hot heading into the fall. From flats to fur, these accessories offer a fresh new look. “Hall of famer Bert Bell spearheaded the idea of a player draft in the 1930’s. 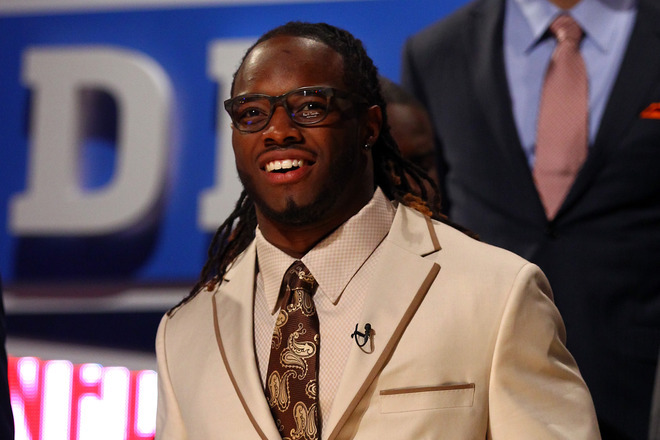 The idea came to fruition with the holding of the NFL’s first ever player draft in 1936. Since that time what has happened in the draft room has set the stage for what happens on the field shaping the destiny of teams for years to come. 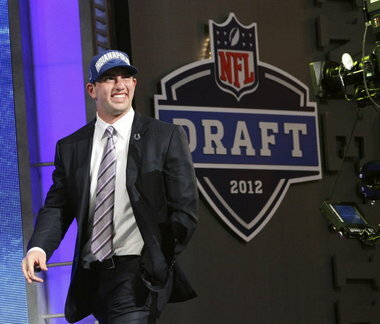 Colts QB Andrew Luck! Well, good Luck to you and get a good clothier. Can't expect grandness looking so, well, safe and plain... C'mon man, at least wear a pocket square. Verdict? Too safe. And you don't advance much in life by being safe. 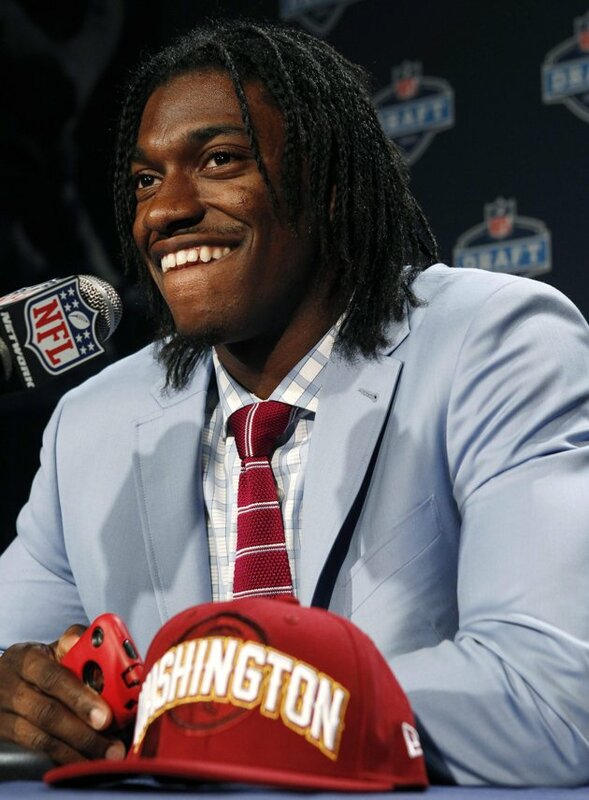 2nd pick, QB Robert Griffin III for the Redskins. We see sartorial potential in the raw! We love the idea of a lighter color suit and plaid shirt. Hopefully, his contract will bring him, among other things, a full sartorial wardrobe. 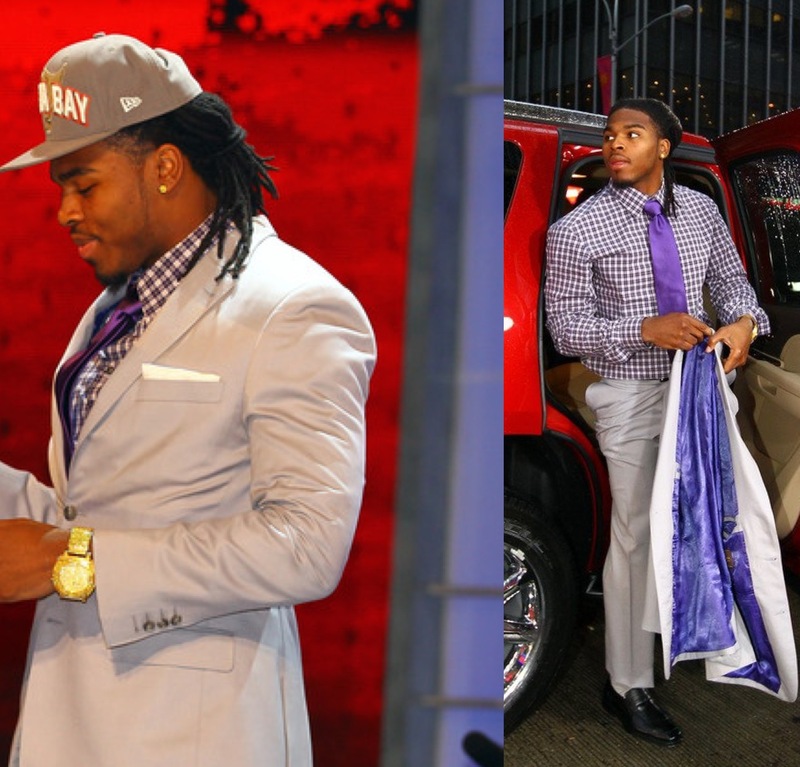 3rd pick, RB Trent Richardson. Oh, Trent, all done with college football. On the other hand, your wardrobe is still missing a couple of more classes. One of the lessons you missed is "less is more." In other words, too much trimming. We think just the lapels would have done the trick! 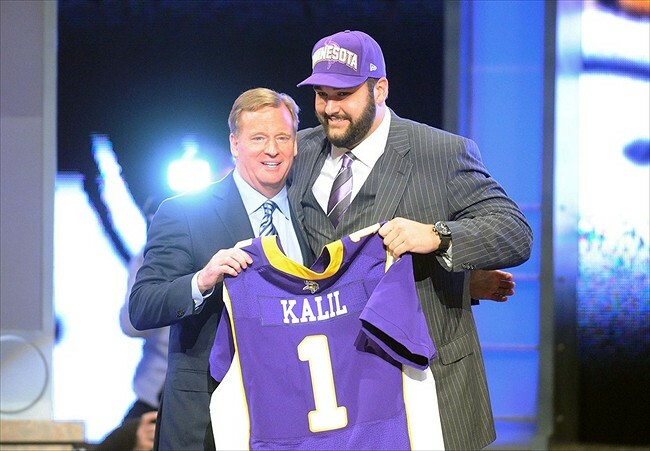 4th pick, OT Matt Kalil. We like what Kalil did. When in doubt, stick to what you know. Well done. A three-piece pinstripe suit is always classic, and a dash of color on the tie? Bravo! 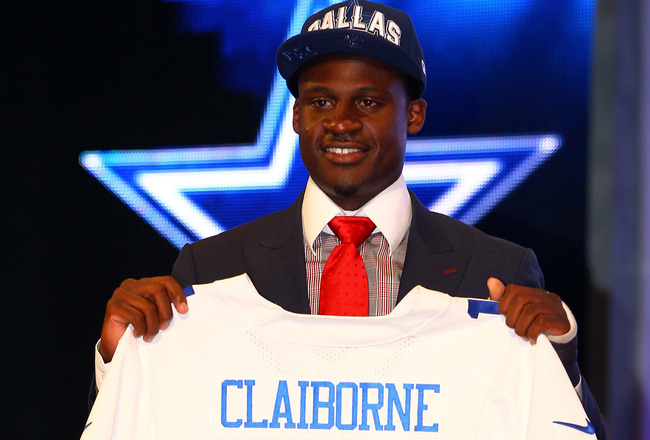 6th pick, CB Morris Claiborne. Hmmm. We are not 100% sure the "bank magnate" is the perfect look for a 22-year-old. Really pushing the envelope far too much. He would have been great in a light fitted suit with a playful shirt and tie combination. Oh well, hang on Morris, there will be plenty more events. 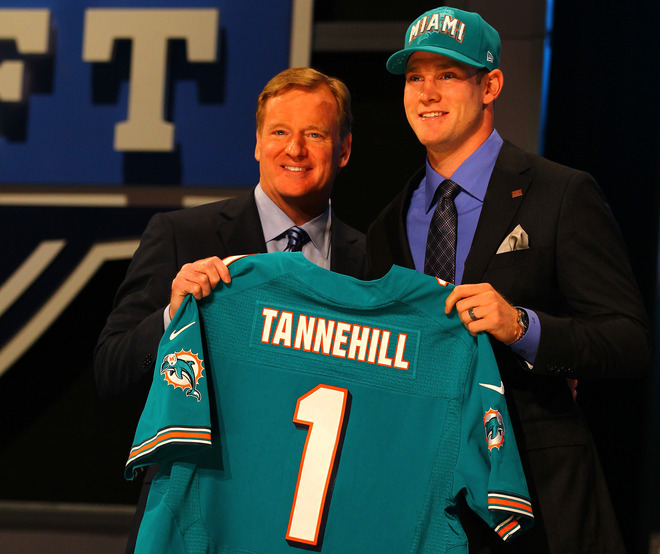 8th pick, QB Ryan Tannehill. An OK look, overall. We love monograms, so good job, Ryan. Now, who is picking these nonsensical pocket squares?! And we are under the impression the Ryan had on a brown belt with black shoes, can someone pass a note: "huge no-no"? 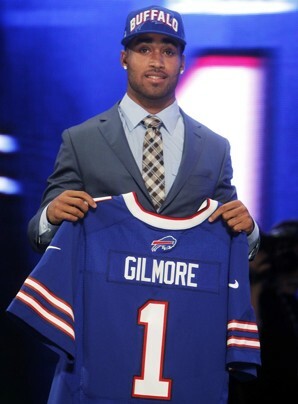 10th pick, Stephon Gilmore. Here we go, finally! This is what we are talking about: effortless, classic, age appropriate, clean-cut look! Good job, Stephon, hope to see you soon!